With a week or more at your disposition, you can investigate Liguria from the west to the east (or vice versa) by following the coast, and every once in a while, heading into the mountains. The “Grand Tour” can begin at the French border, to take you all the way to the Lunigiana on the border with Tuscany. It will let you enjoy views and vistas that abound, colored by the blue of the Mediterranean, always in sight. By train, by car on Europe’s most spectacular highway, or along the old Roman road, the Aurelia, the spectacle is continuous. From Ventimiglia to Bordighera, we will stop in the Valle Nervia, across the coast of Sanremo and Imperia, and explore the lands behind these two Riviera towns. Then there is the fascinating Province of Savona, with more sea resorts, old villages, and typical artisan craft production. Genoa, the focal point of the tour, has Europe’s biggest old city dating to the Middle Ages, but also Apennine Mountains and mountain villages. The fourth province is La Spezia, with the Cinque Terre, gulfs of poets and paradise, and the river valleys of the Vara and the Magra. Liguria has 300 km of rocky, rugged coastline, a few sandy beaches, many pebble beaches, and hills and mountains that drop into the sea. Its valleys and rivers cut perpendicular to the coast, amid luxuriant greenery, filled with flora and fauna that are protected in parks. Liguria also has marine parks that preserve the sea bed. Mediterranean scrub and exotic vegetation mix on the hills, along with traditional agriculture dedicated to olives, vineyards and vegetables. This extraordinary territory is protected by several national and regional parks. There is the Parco Nazionale delle Cinque Terre, and the five regional parks, Piana Crixia, Portovenere, Antola, Portofino and Bric Tana. There are three large UNESCO World Heritage sites in Liguria (the Rolli Palaces in Genoa, the Geo-Park of the Beigua, and Portovenere and the Cinque Terre), two FAI Heritage Sites (the Abbey in San Fruttuoso and the Tower of Punta Pagana). In addition there is the Whale Sanctuary, and six Protected Marine Areas (Portofino, the Cinque Terre, the Island of Bergeggi, Portovenere, Gallinara, and Cape Mortola). 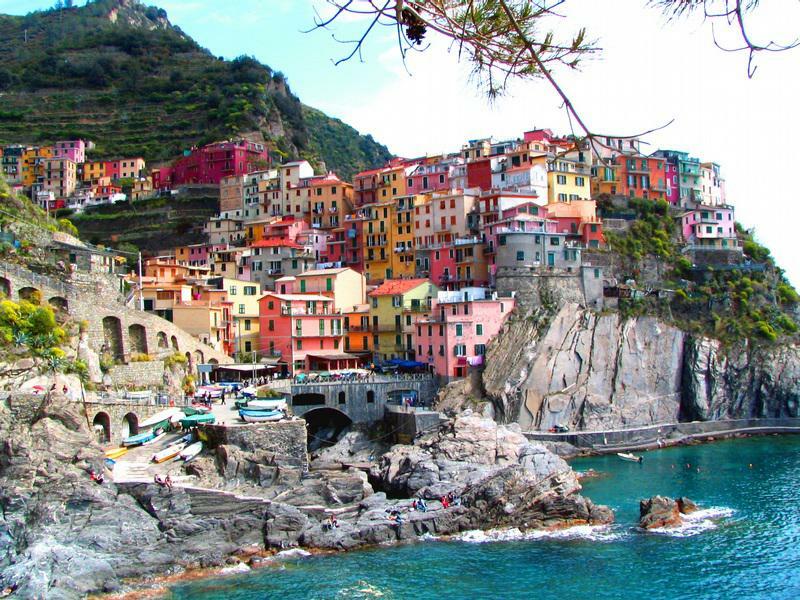 Liguria has 14 Touring Club orange flags; the greatest number of environmentally clean water blue flags in Italy (18); and 19 towns on the list of the Most Beautiful Towns of Italy. What amazes is not just the landscape that is so diverse and unexpected, but the art and architecture that further enhance them. 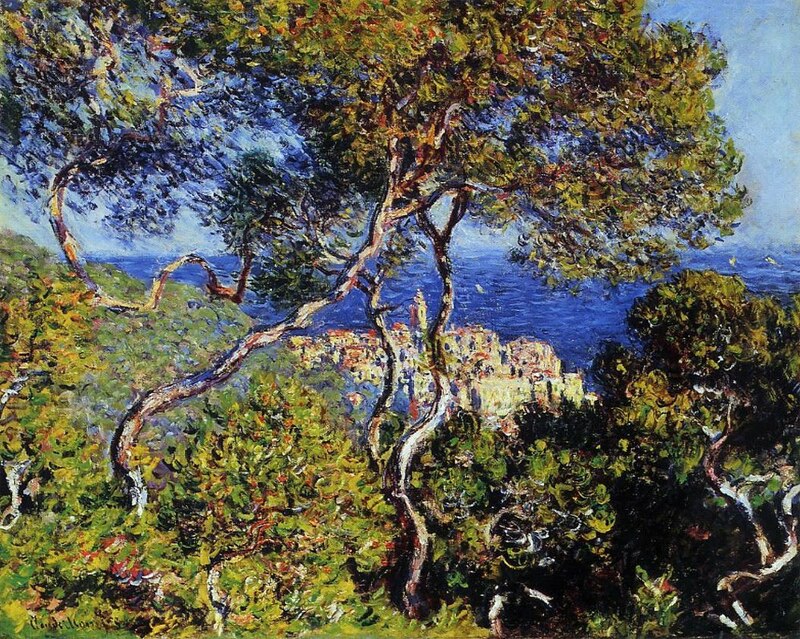 The original splendor of the Riviera has never been lost, or altered, or over-built like many other coastal areas of Europe. Past and present meet here. Preserved Neolithic caves and exceptional modern urban renewal projects like those done by Genoa’s native son, Renzo Piano, perhaps Europe’s most famous architect. Take time, and discover Liguria. The lovely beaches, bays, and boulders of the Riviera can almost all be reached by trails, rock stairs, or steps. There are steamboats from Genoa that take you whale-watching or on excursions to the Park of Portofino (stopping in San Fruttuoso, tiny Porto Pidocchio (the Flea Port) and Camogli) or to the Cinque Terre. Steamboats from La Spezia can take you to Portovenere and Lerici. Bicycles are also part of the Riviera scene. With a bicycle you can organize incredible trips – along the coast, the latest cycle path takes you 24 km from Ospedaletti to San Lorenzo al Mare. Or you can pedal from Cogoleto to Arenzano, without encountering a car. For those who want to take walks with fantastic views, you can go from the main piazza in Portofino to the lighthouse. There are paths to and through villages and small towns. There are parks on the sea, and the Via dell’Amore for the romantic. Or even water slides in a aquatic park, like the Caravelle in Ceriale. For those who like to hike, even with small children, an afternoon in the Val Graveglia – at the Regional Park of the Aveto - is pure joy. This is also the location of the old Gambatesa mine, where visitors can don a yellow helmet and a mantel to get on the little train that takes them into the tunnels. A trip to the Regional Park of the Beigua can be done from Campoligure, where you can also visit the castle and the Filligree Musuem, with its special collection of gold and silver filigree. For the adventurous, you can visit the World War II bunkers on the side of Portofino Mountain over the sea. Or head for the adventure park in Righi, in the huge city park that covers the hills above Genoa next to old stone forts built to withstand Napoleon. Or try out the Indian Forest di Belpiano with adventures for age five and up: vines, bridges, pulleys to move and climb in the forest. The High Road of the Ligurian Mountains, the Alta Via, crosses the watershed line on the crest of the Apennines for 442 kilometers along the Ligurian coast. It is divided into 44 legs of varying length and difficulty, marked by a red-white-red trail marker with AV written in the white portion. Also interesting is the walking tour of the Cinque Terre. For those who like to ski just a few kilometers from the sea, there are ski trails in Santo Stefano d’Aveto and Monesi di Triora. Santo Stefano has just inaugurated the chair lift to Monte Buea. For those who prefer cross-country skiing, the Park of the Aveto has more than 20 km of beaten trails to the forest, Foresta del Monte Penna, and through the Foresta delle Lame Ponte della Iona, while at Colla Melosa, just a few kilometers from Monesi, is a picturesque ring road and a shelter-refuge. Genoa hosts Europe’s biggest flower show and trade fair at the Fiera di Genova every five years. The mountains behind Genoa in the Park of the Antola and in Sant’Alberto di Bargagli and Torriglia host dazzling white fields of narcissus from May to June. And the gardens, Giardini Pallanca and those at Villa Hanbury host many Mediterranean and exotic species of plants and cacti all year round. Summer theatre enlivens the night in the medieval village of Apricale in August, with the magical scenery designed by Lele Luzzati, while Borgio Verezzi has its own Festival Teatrale on its piazza dating to the Middle Ages, and Rapallo has the Festival Internazionale di Valle Christi. For those who love fables and stories, the museum, Museo Luzzati is in Porto Antico, along with a pirate galleon, built for Roman Polansky’s movie, “Pirates” (next to the Aquarium of Genoa). For those who love mysteries, at the other end of Liguria (near the French border) at the site of the 16th Century witch trials in Triora, is the Museum of Witchcraft. For those who are interested in nature, not only does Genoa hold Europe’s second biggest Aquarium, but its Natural History Museum has stuffed sharks, manta rays, and whales all caught in nearby waters (some in the port itself) hanging from the ceiling. Definitely worth the visit, also for its old fashioned bottled specimens dating back over centuries. Sailing, tennis, diving, and extreme sports (canyoning, rafting, free climbing, hang gliding over the sea). Along with many sports entities proposing more than 50 different activities from beach volleyball to windsurf are available all across the Riviera. For those who love golf, there are 18 hole courses in Garlenda and in Rapallo (since 1931), and 9 holes in Arenzano. 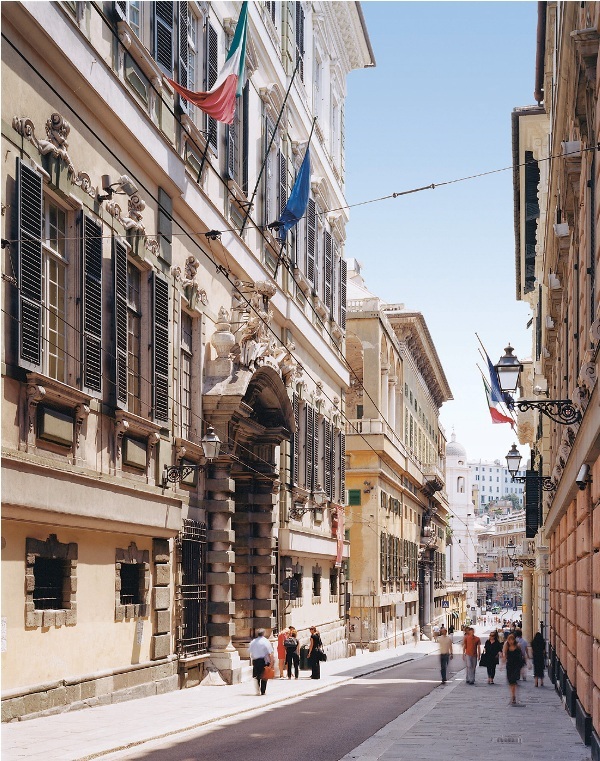 Genoa has the oldest baroque street in Europe (so new at the time that it was named “New Street”, Strada Nuova), built just alongside the world’s biggest medieval old city. Now called Via Garibaldi, every one of the twenty some palaces on the street are UNESCO World Heritage Sites along with the other Palaces of the Rolli and the Ducal Palace (with the apartments of the Doge and a sumptuously decorated chapel dedicated to the Madonna). Also worth visiting at Genoa’s Palazzo Ducale are the dungeons in Torre Grimaldina, where the graffiti of the prisoners can still be read. Genoa was one of the four biggest cities in the world in the 1300s, and also one of the richest. Its old city reflects its wealth – stroll down the pedestrian streets of Via San Lorenzo, Via Luccoli, Piazza delle Vigne, Via San Luca and its lovely namesake Church on a lovely little piazza. Then walk down narrow alleyways to find Palazzo Spinola Pellicceria. Also in the old city, on Via Lomellini, is the Museum to Italian Unification, Museo del Risorgimento (tel. 010 246 5843) in the house where Giuseppe Mazzini was born, with arms, uniforms, flags, and other items showing Italian history. The old city borders on the sea, on Porto Antico, the modern urban renewal project done by native son and world famous architect Renzo Piano,. A tourist magnet it holds the Aquarium, a pirate’s galleon, the Antarctic Museum, the Children’s City, the Biblioteca de Amicis, and more. Just beyond Porto Antico is the Museum of the Sea, Galata Museo del Mare, which now has a new MEM (Memories and Migration) pavilion with interactive exhibits which allow the visitor to reconstruct the history of families – even their own. Included in the ticket is Italy’s biggest submarine, the S 518 Nazario Sauro docked outside. Further down the road is the impressive crusaders’ hospice, the Commenda di San Giovanni di Prè, and on the hill above it (reached by a public elevator) is an 19th century castle built on 16th century walls, the Castello d’Albertis Museo delle Culture del Mondo, which shows the collection put together by a sea captain as he traveled the world. Also worth seeing are the old cities of La Spezia and Savona. For those who love festivals and traditions, Liguria has something to propose throughout the whole year. All cities, villages, and towns celebrate Carnival and their patron saints (with picturesque processions), along with events like the arrival of spring, the festival of the flowers, ancient boat races, or special historic moments. Genoa offers in June an international festival for poetry, that attracts poets from all over the world. The Festival of the Mind is held in Sarzana at the end of August – a theme is chosen, and the most famous philosophers, intellectuals, and artists discuss it. The Festival of the Sciences in Genoa in October has Nobel Prize winners and scientists transmitting their knowledge in conferences, demonstrations, and simulations. Also in Genoa is December’s Festival Circumnavigando, offering circus shows and street artists. Or the Suq, in June, on Porto Antico, a third world show and bazaar. Savona offers, at Easter, its impressive Good Friday procession, inspired by the Via Crucis, whose origins date back to penitential Easter rites in the Middle Ages. Today the Passion of Christ is depicted in fifteen sets of wood carvings called “chests” or “mysteries”, which were carved from the 1600s to the 1900s. They are arried on the shoulders of the devout, who are dressed in capes denoting their confraternities in blue, white, and red. The procession takes place every two years on years ending with an even number. During Christmas a trip to Pentema is highly advised. Located in the mountains near Torriglia, the whole village becomes an amazing Christmas crèche with all the houses participating as they act out peasants and artisans of the past at work, and the manger with real animals. Also worth seeing is a mechanized crèche in Campoligure, which hold moving antique figures in a landscape made to resemble the valley near the Oratory of the Saints Sebastiano and Rocco. Arenzano also has an unusual artistic crèche made in ceramics at the sanctuary, Santuario del Bambino di Praga, which is open all year long. Genoa’s most beautiful crèche is in the Castelletto quarter just above the old city, which can be reached by cable car from the city center. In this church of the Madonnetta, fascinating Christmas scenes in a XVIIth Genoese context can be viewed all year long. The cloth used to make the meter high figures’ clothes were donated by nobles in past centuries. Other interesting crèches can be seen at Villa Luxoro – one with painted terra cotta figures, and a crèche in the old kitchen – and during the Christmas season, at the Franciscan monks’ Church of San Barnaba. Artisan craftsmanship is flourishing throughout Liguria. Some fields have already obtained certification for their product: slate from the Val Fontanabuona (visit their museum or quarries from the Centro Espositivo. Showroom in Chiapparino di Cicagna), damasks and luxury fabrics from Lorsica, filligree from Campo Ligure, Chiavari chairs, and velvet from Zoagli. Lace, damask, and macramé can also be seen at the Textile Museum, while bobbin and crocheted lace at the Villa Tigullio-Parco Casale, in Rapallo. For bee-keeping check out Calice al Cornoviglio where the Honey Museum, Museo del Miele, is located inside Castello Doria Malaspina. Also interesting is ceramics-making, which can be admired in Albissola at the museum, Museo Trucco, Fabbrica Museo G. Mazzotti, and Centro Studi Asger Jorn. Wrought iron and forged iron, glass (link - Altare), fresh and dried floral decorations, and chocolate have also obtained certification regarding their production. For those who wish to relax, Liguria offers many structures for talassotherapy, eliotherapy and sand therapy. Ancient hot water springs are located in Pigna – where the waters from the Assunta reach 30.8° C. – and in Calizzano, Podio and Pontinvrea. To the northwest of Genoa is Faiallo, to the northeast, Val Graveglia, and in an outlying quarter of Genoa, Voltri, there is a spa in Acquasanta. For 103 years, the Colonia Arnaldi has been operating on this theme in Uscio. Ligurian cuisine is tasty and light. Vegetables are at the base of each dish, from fried food to salty pies to the famous Easter Pasqualina. Traditional first courses are based on pasta without eggs. From trofie to the square little lasagna called mandilli, always served with pesto, to the exquisite and light ravioli (whose stuffing can include some meat) and pansoti made with 17 different wild herbs but garnished with a nut sauce. Meats include rabbit, and fish includes the daily catch. Then there are anchovies and bianchetti (baby anchovies) when they are in season, and the mustachioed shrimp of Santa Margherita which is very requested for its deliciousness. All year round Genoese eat dried or salted codfish (stoccafisso and baccalà) served in an infinite number of ways, but wonderful and also dietetic when grilled. Ligurian white wines are light and fresh. Red is Rossese, Napoleon’s favorite. And for dessert, enjoy your sciacchetrà, the sweet wine of the Cinque Terre.